These fennel beet roll-ups are really quick and easy to make, but they are so good. Basically everything gets processed in the food processor and then rolled up in your favorite green leafy vegetable. I used green butter leaf lettuce and radicchio leaves. 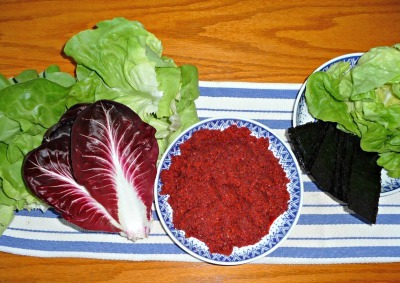 The bitterness of the radicchio gives a great contrast to the sweetness of the green lettuce. Process all but the nori in the food processor until you have a smooth consistency. 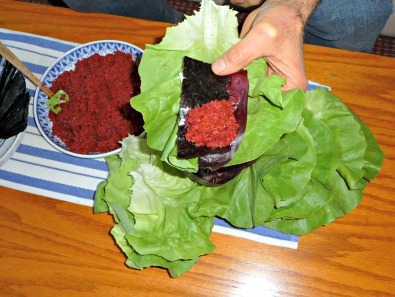 Place a piece of radicchio and nori on the end of a lettuce leaf and add a dollop of the mixture from the processor. Carefully roll up the leaf and Enjoy! Not only does the radicchio add a great flavor component with its bitter taste, but it is very high in antioxidants, foliate, vitamin C, vitamin E, zinc, iron, and copper. 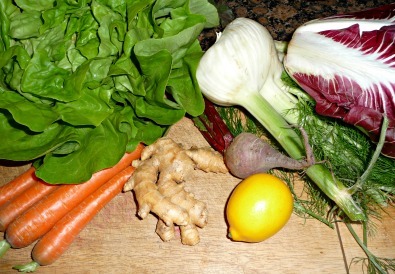 Bitter vegetables are said to be good for the liver. You could add some type of fat to the recipe if you like. Avocado or some nut butter would probably go nicely. If I had an avocado on hand I think that’s what I would have gone with, although the recipe was great without any fat at all. These roll-ups would be fun at a potluck, a dinner party, or just when you feel like treating yourself to something a little extra special, but without the hassle of a time consuming big mess recipe. simple and easy clean up.really tasty and everyone enjoyed. will make again.